Romantic Jewelry Aquamarine Crystals Jewelry for any occasion with Swarovski 18mm Aquamarine Crystals Heart Pendant accented in Silver Plated Chain perfect for your outfit wear & appropriate for the party or to gift to your love one on the very special occasion. 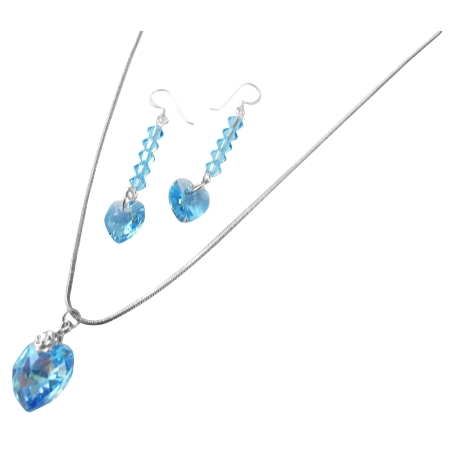 Sparkling Aquamarine Crystals Heart Pendant with Earrings Aquamarine Crystals Beads with Heart Crystals dangling from Sterling Silver Hook 925 very beautiful & gorgeous. Handmade Exquisite Necklace All A Grade & Swarovski Crystals Material are used to make this beautiful Necklace & Earrings.